Raspberry is one of my favorite fruits. So small and in the same way so perfect red fruit. 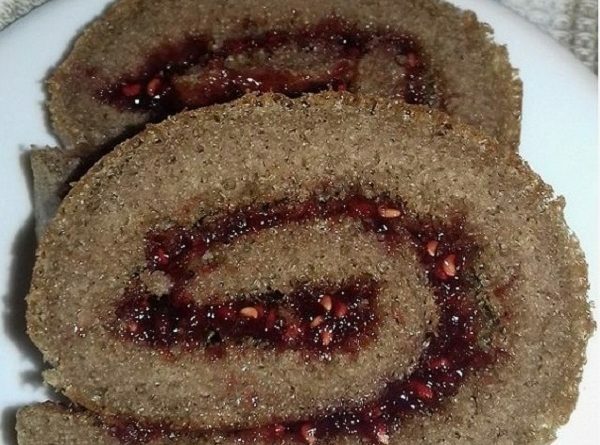 This raspberry roll cake will delight you with fresh flavor. It is low-carb, grain-free, and sugar-free. Put all dry ingredients into a bowl: 1 cup Almond Flour, 1/4 cup Psyllium Husk Powder, 1/4 cup Cocoa Powder, 1/4 cup Erythritol, and Baking Powder. Then adds a 1/4 cup sour cream, butter, and 3 eggs to the dry ingredients. Use a hand mixer to mix this together. Add 4 tbsp coconut milk to the batter to make it so that it’s more workable and spreadable. Spread the batter over a Silpat. Use your hands for that. It should cover the area of an entire cookie sheet.